At twenty-four (and a bit) weeks pregnant, it's starting to hit me. I sailed through the first trimester; I enjoyed the forgetting-I'm-even-pregnant second trimester glow; but, a few weeks shy of trimester three, the signs are starting to show. There are days when I wake up with stiff hips and a slightly achy back - it takes about an hour of moving around for my body to feel fairly normal. There are days when I have to lie down in the late afternoon, not because I actually need to nap, but because my pelvis needs to tilt the other way for an hour or so. There are days when I swear I can feel my tummy growing, as though it's swelling by whole centimetres in the space of half an hour. The ripples of stretchmarks seem shinier than before; I feel pulling at my sides; I feel heavy when I walk. It's getting to be a bit of a thought, leaving the neighbourhood. MM can walk most places these days but there's no contingency plan if she decides she can't then make it back home - I'm avoiding pushing her heavy buggy; I'm avoiding carrying a two year old; I'm lacking the energy to cajole her along or the strength to cart around a bag full of snacks. More and more, I'm suggesting that friends come to our place, rather than us making trips across town. I sometimes wince when I sit on the floor. I have to keep my feet up in the evening. Obviously, this is nothing compared to last time around. 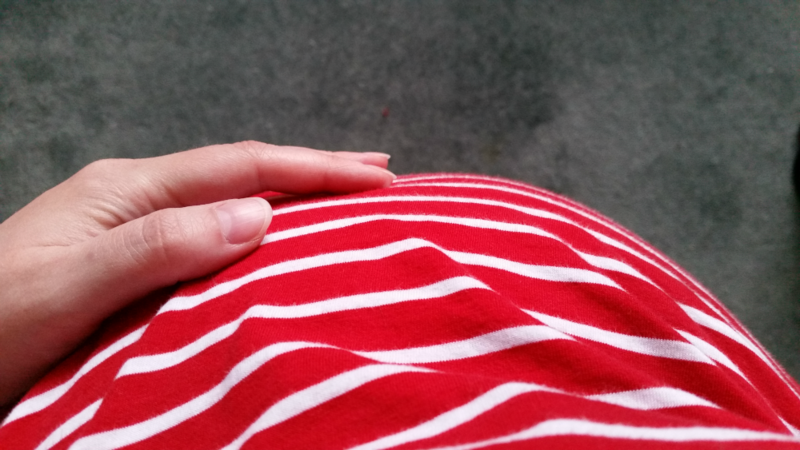 Last time around, at twenty-four weeks, I could barely get down the stairs, so getting to choose between slogging to a cafe or remembering to have biscuits in the kitchen is a bit of a luxury. I'm not complaining. Not yet. I'm finding it interesting, feeling my body change, wondering if this is the way a normal pregnancy works. It's not just physical, though. I'm starting to feel it emotionally, too. Oh, there were the moments of panic, early on, when I wondered what we had done - could we really cope with two kids? afford them? house them? and was it fair to thrust a sibling on our firstborn? - but they were only ever fleeting concerns; my thinking is very much "Other people do this - and do it well - so the chances are we'll be fine" (incidentally: the same thing I told myself last time around). But, no, this isn't panic. Amazement at what my body is doing. That I am growing a whole new person with their very own personality inside of me. Isn't that incredible? I remember feeling overwhelmed by the same thing last time around. After months of looking at pregnant women enviously, feeling like they must know some sort of magic that I didn't because surely it couldn't be as easy as simply happening to do the deed at the right time of month, I couldn't believe that I - me! - was growing a baby. I remember thinking, "This is incredible! I need to do this again! I need to get pregnant again RIGHT NOW! ", despite the impossible timing. And this time is similar. Oh, I'm prepared to wait until after the birth for another pregnancy but, right now, I want six kids. Six. All crammed in, one after the other, in the few years of fertility still remaining to me. We can't afford six kids. We don't have room for six kids. We don't - normally - actually want six kids (we want two; we expect this pregnancy to be my last). 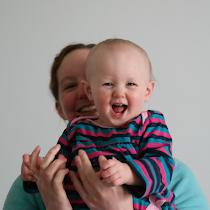 Ask me about this again in ten weeks, when I'm lumbering towards full term, tired and achy and unable to play on the floor at my kid's level, and I'm sure I'll be feeling very differently. But, for now, I'm going to enjoy it, stiff morning hips, swollen belly and all.